Studio Line: Paramount Pictures - France never had a chance! Hold on to your berets -- the Rugrats kids are headed for Paris in an all-new feature-length adventure. France doesn't stand a chance! 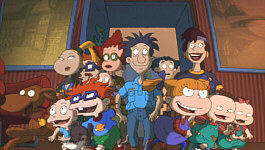 When Stu Pickles is summoned to work at EuroReptarland, Paris' newest amusement park, the Rugrats kids tag along. From the Eiffel Tower to Notre Dame, no attraction is safe from the Rugrats kids who find that fun is the same in any language. Meanwhile, love is in the air for Chuckie's dad, Chas. Could Chuckie be getting a new mom? The Rugrats kids learn valuable lessons in courage, loyalty and true love in this music-filled journey featuring the hit song, "Who Let The Dogs Out? ", and the voice talents of Susan Sarandon and John Lithgow. 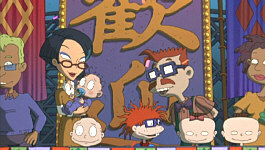 Rugrats In Paris is sure to warm your heart as it tickles your funny bone! Box Office: Budget: $30 million. Opening Weekend: $22.718 million (2934 screens). Gross: $76.214 million. DVD: Widescreen 1.78:1/16x9; audio English DD 5.1 & Dolby Surround, French Dolby Surround; subtitles none; closed-captioned; single sided - dual layered; 10 chapters; rated G; 78 min. ; $29.99; street date 3/27/01. Supplements: Rugrats in Paris Documentary; Theatrical Trailer; 2 Theatrical Promotional Spots; Sound Effects Showcase-Chuckie Chan; 2 Alternate Endings; Baha Men Music Video-"Who Let the Dogs Out? "; 2 Interactive DVD-ROM Games: Chuckie Chan, Mom-O-Matic. No use in denying it - I love animation. The Flintstones and The Simpsons are two of my three all-time favorite TV shows, and I also am quite fond of animated movies. While most of my affections in that domain tend toward Disney offerings - which is why we offer a full section dedicated to their DVDs - I’ve also enjoyed DreamWorks titles like The Road to El Dorado and others such as South Park: Bigger, Longer and Uncut. Heck, I even didn’t mind the inanities of Pokemon: The First Movie and Pokemon: The Movie 2000. 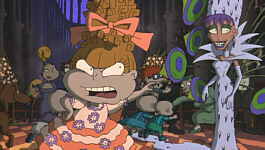 However, I have to draw the line somewhere, and Rugrats In Paris - The Movie helps define my boundaries. When I watched the first Pokemon flick, I lacked much knowledge of the series’ world; I had some familiarity with the characters and theme, but that was about it. My background in regard to the universe of Rugrats was similarly ill-defined before I watched RIP; I had some general understanding of it through Sunday morning strips in the local paper, but that was about it. Somewhat surprisingly, RIP assumes that the viewer will already be well-versed in Rugrats lore. There are few attempts to explain the characters or their usual interactions, so the uninitiated may feel a little lost. But probably not much, since this isn’t exactly the Byzantine world of The X-Files. It’s fairly simple to get a good grasp on things quickly as RIP progresses. Not that I really cared, however, as the story is tremendously shopworn and tedious. RIP - an appropriate acronym - takes the entire gang to Paris where Stu Pickles (voiced by Jack Riley) has to fix a robot Reptar he created for a show at EuroReptar. (No, it doesn’t make much sense for Pickles to tote along his wife, kids, friends and their children as well - the movie offers a lame gag to have this happen.) However, that aspect of the story has nothing to do with the film’s main thrust. Instead, we’ve already learned that geeky little Chuckie (Christine Cavanaugh of Babe) desires a new mommy to replace his dead one, and wheels quickly go into motion to get a wife for his dad Chas (Michael Bell). The obvious candidate appears in sweet, affectionate Kira Watanabe (Julia Kato), but when it becomes clear that she needs a husband to advance in her business, EuroReptar chief - and Cruella DeVil wannabe - Coco LaBouche (slumming Susan Sarandon) horns in on the wheezy Chas. From there it’s up to the ‘Rats to rescue Chuckie and his dad from a horrible fate. I won’t fault the story too much for being predictable; after all, most Disney movies don’t exactly take the path of most resistance. However, I found RIP to be disenchanting just due to the general crudeness of the project. The animation showed the usual stiff, lifeless action typical of TV work; although the images actually looked quite attractive much of the time - RIP boasts a nicely-rendered color palette - the movement was awkward and lacked fluidity. It doesn’t help that the character design favors radically ugly people; I just can’t stand to look at these misshapen humanoids! But that’s not what turned me off in regard to RIP. Instead, it was the combination of potty humor and pointless pop references that left me cold. Apparently the Rugrats style delights in the glorification of excrement. This movie features material that would be too gross for a Farrelly brothers flick! I guess they can get away with it because it’s animated - real-life vomit is more disgusting than stylized cartoon puke, I suppose - but it still seemed nauseating. Maybe it works for kids, but just because something will succeed as a gag doesn’t mean it should be used, and I thought RIP’s dependence on these scatological bits was pandering and excessive. On the other hand, RIP attempted to seem sophisticated and literate with its occasional cultural references. As soon as the flick began, we found a Godfather send-up, and lines from films like Apocalypse Now and A Few Good Men are also echoed. They even toss in a jab at Disney’s Lady and the Tramp. Unfortunately, these allusions fell flat for a couple of reasons. For one, they were all tired bits; none of them seemed clever because the referenced material has been sent up so many times in the past. Also, the gags seemed forced. They felt like nothing more than a weak attempt to pander to the adults in the audience. As such, they provided no humor or inventiveness; if anything, they made me dislike the movie more. One may argue that since I’m not part of the film’s target audience that I should ease up on it. Heck, I’ve heard some folks contend that adult opinions of flicks like RIP or the Pokemon affairs are totally irrelevant, and to a degree, they’re correct. Do my thoughts mean anything to the average nine-year-old? Unquestionably not. However, if a parent reads my review and wants to know if Rugrats In Paris is a well-made piece of work, then perhaps my opinions become more meaningful. Just because a movie is aimed at kids doesn’t mean that it has to be cheap and pandering. Unfortunately, Rugrats In Paris clearly falls into those categories. It’s a joyless, lifeless, witless and unfunny piece of work that failed on virtually all levels. If I can find some fun in Pokemon - love that Squirtle! - then I can’t be too close-minded in regard to kids’ entertainment, I suppose, but the appeal of the Rugrats world escapes me. 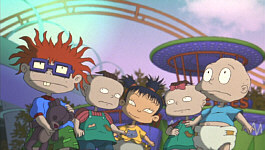 Rugrats In Paris - The Movie appears in an aspect ratio of approximately 1.78:1 on this single-sided, double-layered DVD; the image has been enhanced for 16X9 televisions. Although the cheap animation made the overall presentation less than stellar, I found the picture itself to appear almost immaculate. Sharpness seemed consistently excellent. All aspects of the movie looked crisp and well-defined, and I noticed no signs of soft or fuzzy images. Moiré effects and jagged edges also presented no concerns, and the print seemed almost totally devoid of defects. I detected a speck or two, but that was it. Otherwise the movie seemed totally fresh and clean. Colors appeared absolutely stunning throughout RIP. 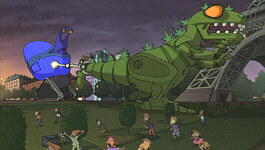 The film boasted a very bright and varied palette that ranged from Reptar greens to vivid reds and vibrant blues. The scheme was much deeper than I’d expect, and all of the tones were reproduced exquisitely well. Black levels also seemed dark and rich, and shadow detail looked clean and appropriately opaque. Ultimately, the image of RIP approached “A+” levels; only a few print flaws and the general ugliness of the animation kept it from that status. While not as terrific as the movie’s picture, the Dolby Digital 5.1 soundtrack of RIP also worked pretty well. For the most part, the film featured a soundfield that emphasized the forward spectrum. In that domain, audio appeared to be accurately placed and the sound blended together nicely to create a rich environment. Surround usage usually tended toward general ambiance, but quite a lot of discrete effects appeared from the rears as well. These seemed especially solid during the action sequence at the climax as Reptar ripped through Paris. The mix didn’t overwhelm me, and it generally appeared somewhat modest, but the soundfield provided a largely positive experience. Audio quality seemed good as well. Dialogue always came across as natural and distinct, with no edginess or problems related to intelligibility. Music appeared bright and warm, and it offered decent bass response for the most part. The effects also were clean and accurate, and they showed some good low end, though the movie rarely registered on my subwoofer; bass information tended to avoid seriously deep tones. Nonetheless, RIP offered a vivid soundtrack that worked fairly well for the movie. In addition, this DVD includes a smattering of supplements. 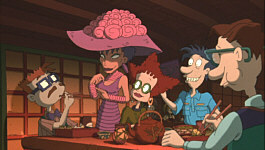 Most significant is a modest documentary about the film called The Making of Rugrats In Paris. This bubbly little show runs for 17 minutes and five seconds and it provides a moderately fun look at the creation of the movie. It moves as a rapid pace and it mainly focuses on the voice talent involved. As such, we get some superficial but nice moments with the actors, especially Susan Sarandon. You won’t learn much about film production, and you’ll likely forget you watched it 20 seconds after it ends, but it’s still a cute enough experience. Speaking of Sarandon, the DVD tosses in two Alternate Endings that involve her character. Presented in Dolby Digital 5.0 sound, these each last 23 seconds. Both give her ignoble conclusions, but one seems exceedingly disgusting, even for this flick. A mildly interesting look at the art of foley work appears in the Sound Effects Showcase. This area offers the “Chuckie Chan” dream sequence with just the isolated effects. Shown with DD 5.0 audio, this is a modestly fun piece, although the homogeneous sound of the effects makes it a little dull; it felt as though all we ever heard were the “whooshes” attached to Chuckie’s kung fu moves. Still, it’s a neat little presentation. In addition to the film’s theatrical trailer and two brief, live-action “promo spots”, we get the music video for Baha Men’s mega-obnoxious obnoxious megahit “Who Let the Dogs Out?” The only thing more annoying than the song itself is the video, which combines a few clips from RIP with some stunningly grating lip-synched performance snippets. Ugh! Lastly, we find some DVD-ROM materials. In addition to a few still cartoons available on the opening screen, we get two games. “Mom-O-Matic” allows you to combine facial features of a few different female characters to create a new “Mom” for Chuckie, while “Chuckie Chan” offers a side-scrolling action contest in which Chuckie needs to jump a series of baddies to grab a golden ring from a dragon at the end. The former will be cute for little ones - at least for a minute or two - while the latter was banal but hard. Okay, maybe I just stink at the game, but I had a surprisingly tough time negotiating the course. While I suppose there’s something more embarrassing than failing at a game intended for toddlers, I can’t think of it right now. 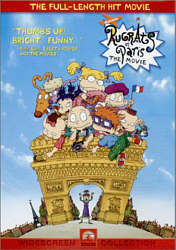 Rugrats In Paris - The Movie was essentially my first experience with the universe of Rugrats, and I hope it’ll be my last. I found the film to lack charm or wit, and it did little more than provide 78 minutes of excrement-oriented “humor”. The DVD provided an absolutely stellar picture plus very good sound and a few decent extras. If you or your kids likes Rugrats, you should be happy with this production, but those unfamiliar with the series should probably skip it.